Consider whether a Resident Return Visa or the NZ 189 Visa is the best option for your family. The Department of Home Affairs (DHA) have provided some advice about applying for the NZ 189 Visa. Failing to provide all the required information and supporting documents can delay your application by many weeks. Also read the pathway to citizenship and NZ 189 Visa information on the Department of Home Affairs website, in particular, the Overview, About this visa and Eligibility tabs. Anyone granted the NZ 189 Visa will not be affected by any proposed changes to citizenship eligibility. 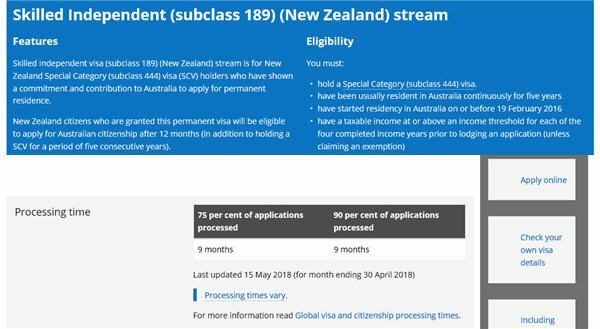 A new permanent visa, the Skilled Independent 189 (New Zealand) Stream became available on 1 July 2017 for some non-protected Special Category Visa-holders (SCV). You can apply online by creating an ImmiAccount. The primary applicant must either meet the income threshold in each of the four most recent financial years, or be eligible for an income exemption. Not all New Zealanders will be eligible to apply, including students, retirees, carers of children and some people unable to work due to an injury. Being made redundant, becoming unemployed, salary sacrificing and negative gearing are not grounds for an income exemption. If the primary applicant does not meet the income threshold or income exemption criteria they cannot apply. 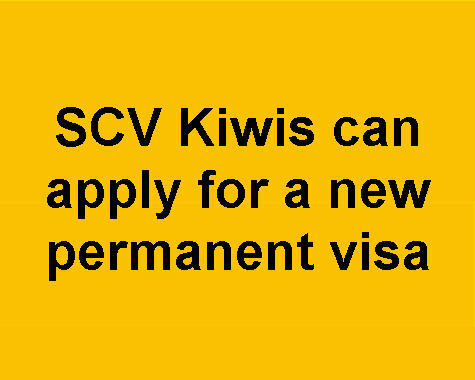 The new permanent visa does not change Kiwi’s eligibility for RRV, nor does it affect the Special Category Visa that many Kiwis in Australia reside on. If you are not eligible for the new permanent visa you can continue to reside on the Special Category Visa. If you began residing in Australia on 19 February 2016, you can apply after five years, provided you meet the other eligibility criteria. If you were not in Australia on 19 February 2016, but can demonstrate you were usually resident you will also be eligible to apply. There is no maximum age restriction when applying for the Skilled Independent 189 (New Zealand) Stream. The primary applicant can include their partner and dependent children on the application. Partners and children only need to meet the health and character and security checks. Resident Return Visa or NZ 189 Visa? If you are also eligible to apply for a Resident Return Visa, and have a partner and/or dependent children to sponsor, you must consider whether RRV or the new visa is the best option for your family. If your child becomes a permanent visa-holder they will not be eligible for a HELP loan until they attend their citizenship ceremony. Only you can decide what the best option for your family is given the cost, time taken to process each visa, be granted citizenship and attend a citizenship ceremony. Oz Kiwi cannot advise on the best pathway for your family. Once you are granted a permanent visa you cannot renew an NZ Family Relationship 461 visa because you are no longer a Special Category Visa-holder (SCV). You will need to include family on your application for the NZ 189 visa, or sponsor them for a Partner visa or dependent Child visa when their current 461 visa expires. The taxable income threshold for the Independent Skilled 189 (New Zealand) Stream is set at the same level as the Temporary Skilled Migration Income Threshold (TSMIT). The table below shows the taxable income threshold required to be eligible for the New Zealand Steam 189 Visa. Your ATO Notices of Assessment must show you have earned the TSMIT for the four most recently completed income years immediately prior to application. The tax file number must be removed or obscured. You cannot use your business income to meet the income threshold. If the primary applicant does not meet the taxable income threshold or an income exemption criteria for EACH of the last four years they cannot apply. Ask your accountant or tax agent for copies of your tax assessments, or log into the My Gov website. receiving compensation/rehabilitation for an injury that would be discontinued if you returned to New Zealand. You are also eligible for an income exemption for periods of maternity, paternity or carers leave during the qualifying period. Assessment is on a case-by-case basis including whether you resumed/intend to resume earning the income threshold within a reasonable timeframe. Unfortunately, returning to work part-time and earning below the income threshold will probably see your application declined. evidence of parental leave/carers leave such as a letter from your employer. Scan or photograph all your supporting documents in colour, one document per file. The scans and photos must be clear. If a document is more than one page, save it all as one file. Give files a descriptive name, for example, John Smith birth certificate. Note: the ImmiAccount system will only upload jpg files smaller than 500 KB each. a certified copy of your passport photo page, passports must be valid for at least 12 months. a NZ criminal history check, regardless of how long you’ve lived in Australia (now only valid for six months). New Zealand Ministry of Justice Consent to Disclosure of Information form. The MoJ request ID number is shown on your NZ criminal history check. a health examination (valid for 12 months). their passport photo page (certified), passports must be valid for at least 12 months. their NZ criminal history check if aged 16 or older (now only valid for six months). police certificates from any country applicants have resided in, aged 16 or older, for 12 months or more in the last 10 years. health examinations for all visa applicants (valid for 12 months). You are required to provide supporting documents for family members who are either an Australian citizen, not being included in the application or deceased. Show proof your child is studying fulltime and financially dependent upon you. For example, paying their study fees, travel costs, clothing etc. If they live with you provide copies of their bank statements or ATO documents with your address. Dependent children must be aged under 23 at the time the visa is being processed, which can take between 10 and 16 months. There is an exemption for a child aged over 23, who is unable to support themselves due to disability. Request a New Zealand criminal conviction history for each visa applicant aged 16 or older. The Department of Home Affairs may ask for one even if the applicant has resided in Australia for more than 10 years. Tick the box at step 3 of the form – Full record of convictions – to request your full record. There is no fee, it remains valid for six months, and takes 1-3 months to be processed. Section 8: Purpose of Check – select code 33 For Immigration/Citizenship. All criminal convictions must be declared in the visa application, including historical or minor sentences. There is no “clean slate” when applying for a visa or citizenship. Failure to declare convictions will see your application declined. You will also fail the character requirements if you have been sentenced to 12 months or more, including historical offending or multiple short sentences totalling more than 12 months. A suspended sentence, ie where no jail time was served, is still a prison sentence. All members of the family will require a health examination. Health checks are only valid for 12 months. Consider booking a few months after submitting your visa application as it can take more than 12 months to process the visa. An applicant who fails to meet the health requirement will be notified if a health waiver is going to be considered. If there are significant costs or services are in short supply the applicant will probably not meet the health requirement. Where costs are covered by Medicare you can argue that the applicant will continue to receive treatment regardless of their visa outcome. There are different health examination requirements depending on an applicant’s age. Anyone aged 15 and over must provide a medical examination, chest x-ray and HIV test. Children aged 14 should also provide an HIV test. Home Affairs will request an HIV test if the child is aged 15 when the visa is being processed. A medical examination, chest x-ray and HIV test costs between $350 and $460 depending on your location. $945 each child aged under 18 (when the application is submitted). Applicants are required to pay 20 percent of the VAC when they lodge their application. DHA will issue an invoice for the balance to be paid before granting the visa. In November 2018 the Department of Home Affairs reported 75 per cent of New Zealand 189 visa applications are processed within 10 months, and 90 percent within 16 months. Failure to provide all the required information and supporting documents when submitting your application can cause many weeks delay. You do not need to tell Home Affairs of any planned overseas travel and you can be outside of Australia when the visa is decided. Special Category Visa-holders do not need a Bridging Visa. Family members on a temporary visa, ie a 461 visa, will be granted Bridging Visa A which will come into effect if their current visa expires before the NZ 189 Visa is granted. They must then apply for Bridging Visa B before travelling overseas. You can be outside Australia for up to 90 days each year or your visa will be cancelled. Speak to Home Affairs about work-related exemptions. Keep a copy of your Visa Grant Notice with your passport. Confirm with Immigration staff at the airport, when you re-enter Australia, that you haven’t been granted a Special Category Visa (subclass 444). RRV or the new visa option? 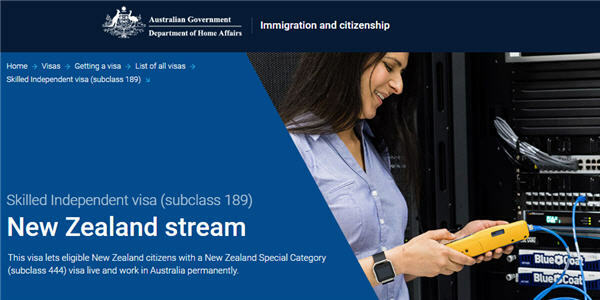 More information about the Skilled Independent (subclass 189) (New Zealand) stream is available on the Department of Home Affairs website. Protected Special Category Visa-holders can apply directly for citizenship subject to meeting the residency and character requirements. Email the 189 (NZ stream) processing team, phone the Department of Home Affairs on 13 18 81 or contact them via social media. Please do not provide your personal details on a public forum. The above “Applying for the New Zealand 189 Visa” information should not be relied on as an alternative to advice from the Department of Home Affairs, or a professional immigration services provider.